TikTok, the world's leading short form video platform, and Sony Pictures Entertainment have teamed up on a promotional campaign based on the Columbia Pictures hit psychological thriller "Escape Room," as the film continues its international rollout. For this campaign, Sony Pictures recreated elaborate escape rooms from the film, including the "shrinking room" and the "ice room." The promotional partnership officially kicked off last week in Madrid, Spain, where Sony Pictures and TikTok co-hosted a "Creator Event" for 30 leading influencers from over 17 countries, as well as TikTok's "creators" from eight countries: UK, Brazil, Mexico, Russia, Switzerland, Thailand, Malaysia and Spain. Both groups participated in escape room challenges and recorded their experiences generating over 75+ pieces of content. TikTok's "creators" included the exceptional magician @magicsingh, comedian Karol Konk @karolkonk and the talented makeup artist and body painter @vickybanham, who all shared their experiences with their fans and on the Official Escape Room Movie TikTok page. The event ended with massive scavenger hunt, exploring Madrid's prominent landmarks, solving puzzles and photographing and sampling local Spanish tapas. The prize for the winning team was a special fan screening of the film in their local markets. TikTok users can now follow the creators and the "Escape Room" official page @escaperoommovie to experience the excitement of the much-anticipated hit film. "Escape Room" is a psychological thriller about six strangers who find themselves in circumstances beyond their control and must use their wits to find the clues or die. Directed by Adam Robitel, the screenplay is by Bragi Schut and Maria Melnik and the story by Bragi Schut. The film is produced by Neal H. Moritz and Ori Marmur. Rebecca Rivo serves as executive producer. The film stars Taylor Russell, Logan Miller, Deborah Ann Woll, Jay Ellis, Tyler Labine, Nik Dodani and with Yorick van Wageningen. "TikTok's community interests and demographic are perfectly in line with Escape Room's audience and we are thrilled to team up with Sony Pictures. This collaboration allows us to offer a unique experience to some of our fabulous "creators" but, most importantly, to create exciting and engaging content for our global community," Stefan Heinrich, Head of Global Marketing at TikTok, said. "An innovative and immersive thriller like Escape Room makes for a perfect collaboration with global innovators like TikTok. With Sony Pictures Spain creating the live experience in Madrid, based on the movie, the TikTok creators were able to generate their own fun and shareable UGC for their followers and spread their excitement about the film," Sal Ladestro, Executive Vice President of International Marketing for Sony Pictures Releasing International, said. 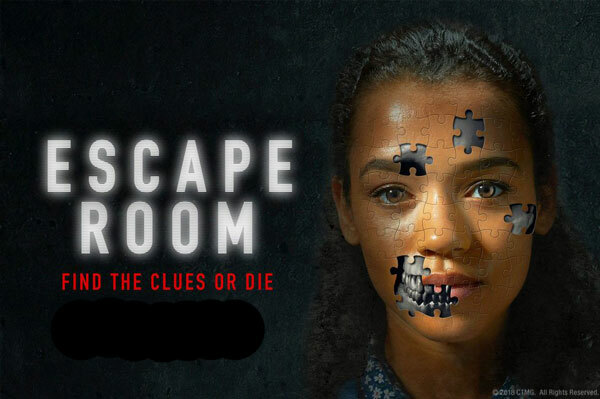 "Escape Room" debuted in U.K. cinemas on February 1 and it's the latest of Sony Pictures' successful genre film releases, which also include the Insidious franchise and "Searching." Sony Pictures Entertainment (SPE) is a subsidiary of Sony Entertainment Inc., which is a subsidiary of Tokyo-based Sony Corporation. SPE's global operations encompass motion picture production, acquisition, and distribution; television production, acquisition, and distribution; television networks; digital content creation and distribution; operation of studio facilities; and development of new entertainment products, services and technologies. SPE's Motion Picture Group production organizations include Columbia Pictures, Screen Gems, TriStar Pictures, Sony Pictures Animation, Stage 6 Films, AFFIRM Films, and Sony Pictures Classics. For additional information, visit sonypictures.com/corp/divisions.html.